Be the first in your neighborhood to celebrate spring with an explosion of gorgeous rosy purple blooms. 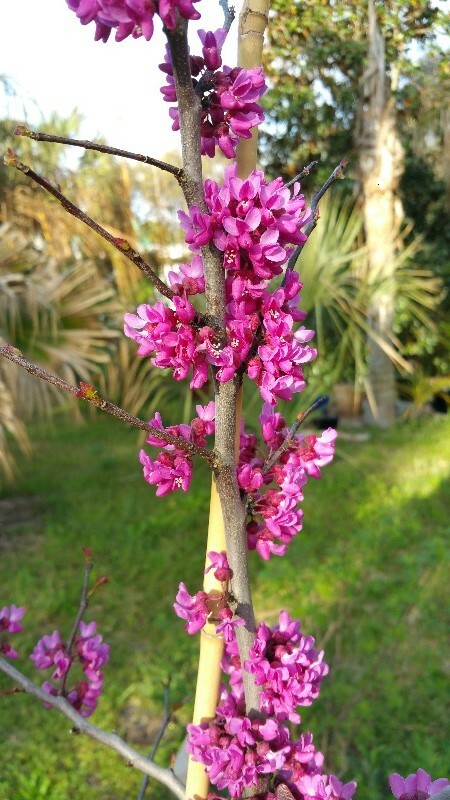 The Oklahoma or Texas Redbud is loaded with early blooms that bring life and color back to a barren winter landscape. Spring isn't the only season to admire your Oklahoma Redbud though! The wide canopy boasts an umbrella shape that looks lovely even during winter's dormancy. Redbuds have showy, shiny, heart-shaped leaves that glisten in the sun. Young leaves emerge in spring, shimmering red and as they age turn a crisp, clean green. In fall the green fades to a lovely yellow that you won't want to miss. Red-purple seed pods add further interest in spring, turning brown in late summer and often staying through winter. The pink-purple blooms coat the Oklahoma Redbud throughout spring. Gardeners of all levels LOVE this tree! It is compact, only growing between 15-25 feet wide and tall. The Oklahoma Redbud is deer and drought tolerant and an incredibly strong tree that stands up well to wind and ice. This tree grows in full sun to part shade and is adaptable to any soil as long as it isn't saturated. Wildlife and birds love the seed pods. The blooms attract butterflies and hummingbirds. Use the Oklahoma Redbud as a specimen tree, deck or patio tree. Redbuds look stunning in mass. Line both sides of a large walkway or driveway for a big WOW factor. However you choose to add the Oklahoma Redbud to your landscape, you are sure to adore it for years to come! When planting your Oklahoma Redbud be sure you have the right location and conditions for your new tree to thrive. Spring and fall are ideal times to plant. However, if you avoid extreme temperatures you can plant almost any time of the year. Beautiful tree, healthy, undamaged in transit and thriving after delivery. The tree arrived on time and was very well packaged for transportation. 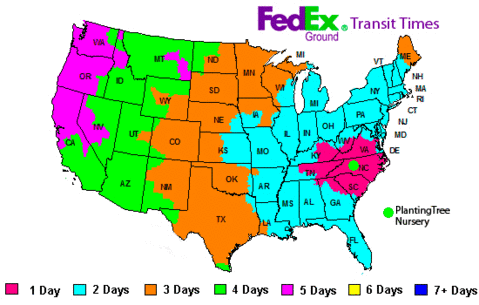 Oklahoma Redbud was ordered on Sunday night, 11 March. Tree was sent on 12 March and I received in 13 March when it was planted. Tree is 5 1/2 ft tall, as advertised, and was sent in a container surrounded by a brilliantly designed cardboard box - packed better than anything else I have ever received. Tree was blooming when it arrived and it is still blooming today, a month later. The Charleston area has many redbuds of various colors, but the color on this Oklahoma Redbud is magnificent. I'm hoping it will like it here, and if it makes it through the year, I will order more from The Planting Tree. I could not be more happy.